I just drove from Texas to North Carolina where I will leave all of my stuff at my parents house while I’m hiking the trail. I’m quite disoriented right now. That may be because of the lack of sleep in what turned out to be a 25 hour drive with two short stops; 1 for waiting out a hail storm in Mississippi, and 1 for a few hours in Alabama to sleep and wait for the sun to rise for better road visibility in the rain. But my disorientation is also probably related to this sudden upheaval – within a week I quit my job, said goodbye to great friends in Texas, sold my bed and couches, and brought all my possessions and dog to North Carolina. Our own possessions and personal spaces often give us much of our identity – and now, per my own choice, I am homeless, jobless, and mostly lacking in possession (which I’ve gradually sold in anticipation of this adventure). I was expecting this to be more freeing and less terrifying. Yet, the only the direction is forward. I feel incredibly blessed to have this opportunity. I’ve seen many on the online AT forums dream of having their life sufficiently in order such that they would be able to do a thru-hike. Many wait for decades until they retire to hike the trail. I’ll mostly be buying food as I go but there are some items I’m going to send to Post Offices along the trail. 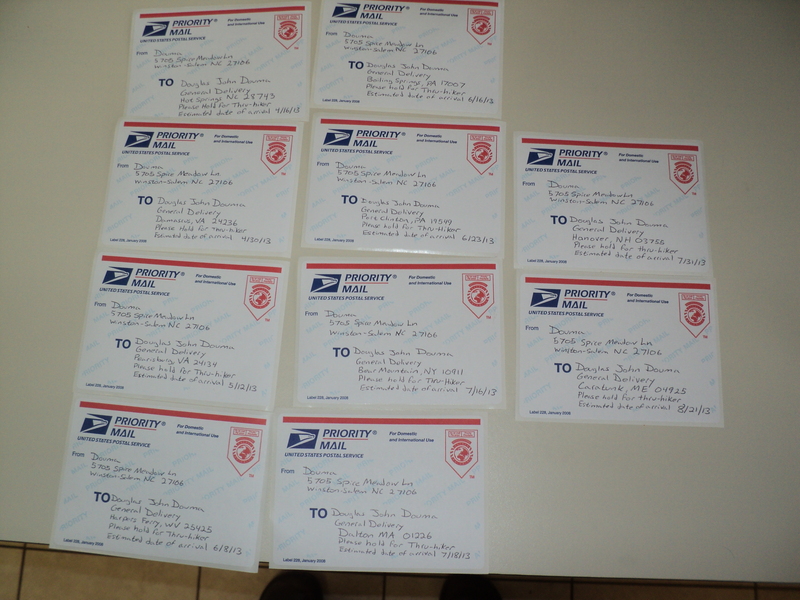 There are Post Offices which accept “general delivery” for trail Thru-hikers. I’ve found a list online of over 100 of these Post Offices, but plan on just using 10 of them. I’ve figured the estimated dates of arrival just on a linear approximation of 14 miles per day. In reality I’ll be walking slower at first and faster at the end. If you send a package you’ll want to give it a couple weeks ahead of me to make sure I don’t miss it. This entry was posted in Appalachian Trail - 2013. Bookmark the permalink. Stay safe buddy and have a glorious adventure. Why are Jack and I not in the least surprised by this new development? You are an amazing young man. This is an experience of a lifetime and I am neon green with envy. Enjoy it and soak it in. Expect some love at one of those post offices! I’m glad you decided to do the boxes after all… good decision. I think that’s a great way to stay connected to everyone… plus we get to feel like we’re part of your adventure too! 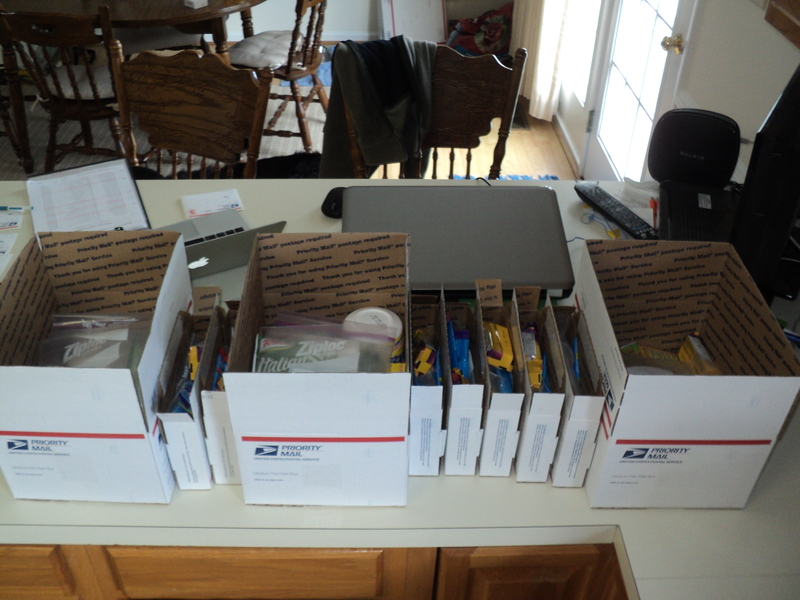 Seriously, I bet after a while on the trail… you’ll definitely be looking forward to seeing some care packages!